As this riddle begins, a painter and a spectator, talking and looking. The painter is trying to make her spectator see something. Her spectator is mesmerized with what she is seeing, and she finds something wrong in the picture. This of what isn’t apparent fascinates her and so she looks on some more. Wait a minute, something is wrong here. The rim of the bottle isn’t touching the ground all the way. The bottom curves on its sides but unevenly. Now the picture makes her aware she is looking at a construction of forms. 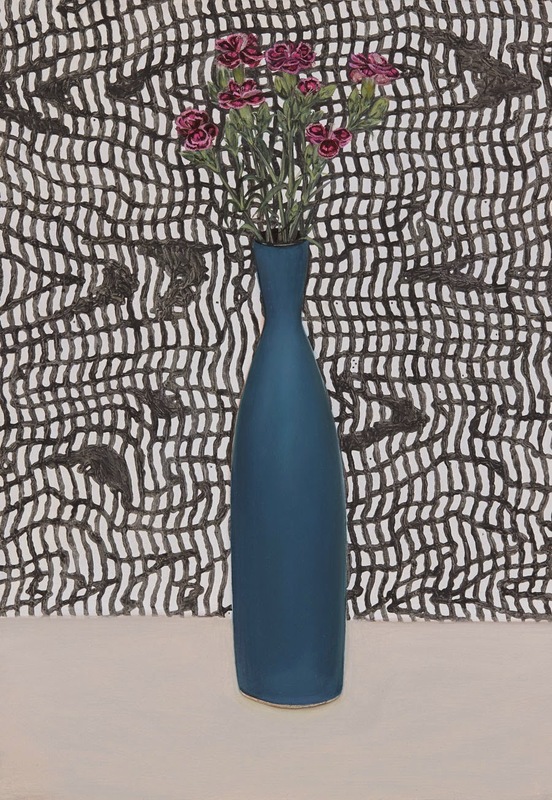 This painting is showing her more than just stems of flowers inside of a blue vase. It is made to look that way. But why? Is the painter trying to say something to her that isn’t immediately obvious? When we get used to the look of something, we hardly stop to see the nuances and variations make up the uniqueness of each thing. Everything is all the same but different. The painter makes the spectator stop to look at the thing that we are used to looking at, and so very used to looking at. Her intention is beyond conveying the beauty of nature even though the flowers are pretty. The prettiness is a ruse to make her spectator to notice the strangeness to betray her ordinary reaction. The painting has a sense of depth of field, it stands in contradiction to the flatness of its background. The background is imperceptible to the eye with its tightly arranged patterns in different shades of grey. The spectator is not able to trespass the pattern that looks if a spider's web. The painter tells her, what she is observing is in fact a pattern of enlarged formally designed variables found inside of a letter envelop, meant to conceal what's inside. Remember the pretty flowers that first attracted the spectator’s eyes? Now she is struggling to separate the petals of the flowers from the security background. Maybe that is the point of this. The painter is playing a trick of the eye. What the spectator learns from her struggle is that objects can never exist alone. The background is in the foreground, and the foreground supports the background evenly. 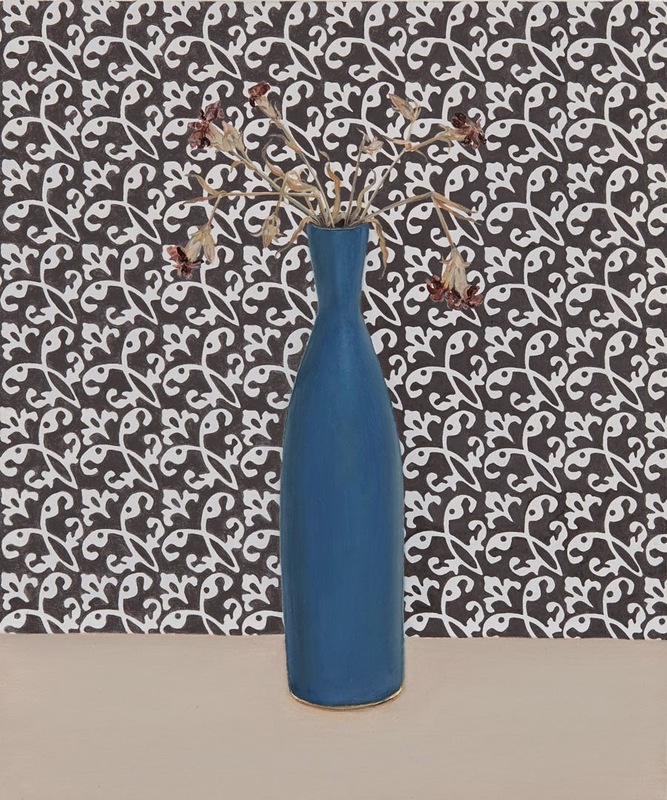 Just as the background hides the flowers from standing too far from the pattern, the pattern simultaneously takes over as an unavoidable subject transforming into the focal point. There is no separation between the subject matter and the background, everything working as one, to make her see. At this moment, the painter steps into the spectator’s mind, she tells her to look again, maybe the strangeness is what the painting is about. Space like time is abstract as the painter makes her spectator see the line dividing the pictorial space. It cuts off the pattern from taking over the whole composition. The background continues without the pattern but carries on with a single color of various tones and shades. Now she sees that what distinguishes space is just light and color. The formal variables are what the painting is about. The spectator asks the painter: “do you paint the same subject matter of similar background repeatedly hoping to get it right for once?” “You’d think that’s it,” replies the painter. At this moment, the spectator and her painter has established enough familiarity to tell you that both her question and her answer are but a riddle. Jen Mazza has made many other paintings of which she experiments with formal compositions. She is represented by Tibor De Nagy Gallery.